The Rio Gol Gol, if you can deal with the heinous culiwachos during the summer months(similar to horse flies), is in my opinion the best bang for your buck waterfall run in Chile. Easy put-in on the border of Argentina, literally at the border. Drops in order. 1st drop Salto de Novios(overlook from the road) 12 ft down the left boof run out down the left. 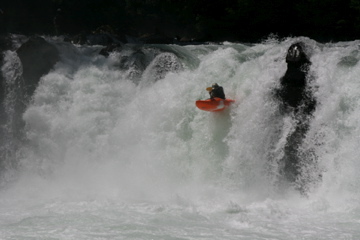 paddler:Evan Garcia @ high water. 2nd drop 5 ft ledge boof right. Immediately following is the 3rd drop, powerful 20 foot waterfall, boof center. paddler: Dave Fusilli @ medium flow. 4th drop higher water down the right plug into a sloping 20 foot seam(weird piton rock at lower water on the right) Med-low water we ran right, 2 step rapid boof left heading right off a 5 ft ledge followed by a sloping 10 ft ledge into a hole down the right. 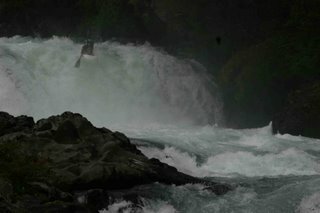 paddler: Evan Garcia finding the piton rock on the river left plug line. 5th drop a 10 ft ledge boof left or center. paddler: Evan Garcia Boogie rapids lead to the 6th drop, 30ish ft tall Princessa, we scouted in the middle of the river on an island with an eddy directly above the falls. Tricky lead in. Caves and undercuts on the left at the bottom. Portage right. 7th and final drop and biggest, Salto de Indio, 45ft tall intimidating drop with a hole you have to skirt in the lead in and plug down the left. This drop serves up some crazy downtimes. 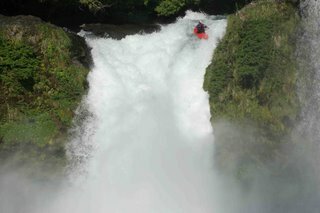 pictured paddler: Chris Korbulic @ hiiiigh water! Portage left. Take out left at bridge downstream. What a river!